I’ve been in deepest Vermont for the past few days, teaching food writing at Sterling College. It’s a fantastic school that is also a working farm – and the students turned out to be wonderful. Really good writers. One of the students is working on a moving piece about her Indian roots. 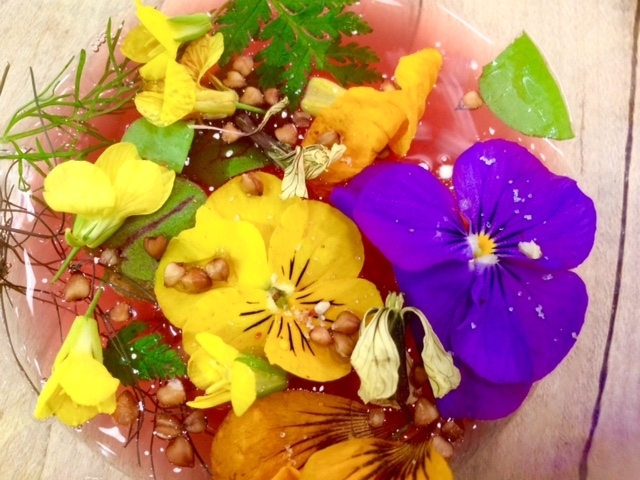 I promised to send a short list of pieces I admire that tackle the subject of food and race. Then I threw in a couple on gender as well. This is very preliminary, but I thought you might also be interested. The whole premise of A Room of One’s Own rests on the difference between the delicious food served at the men’s college in Oxford, and the terrible food at the woman’s college. It is the source of her famous quote about not being able to think well, etc. if one has not eaten well. Gently roll the dough out and fit into a 9-inch pie pan. Crimp the edges and put into the freezer for 15 minutes. Wash and dry the apricots. Break them in half with your fingers and remove the pits. Put them into the pie shell. Melt the butter over medium heat. Stir in sugar, flour, salt and grate in a half teaspoon of nutmeg. 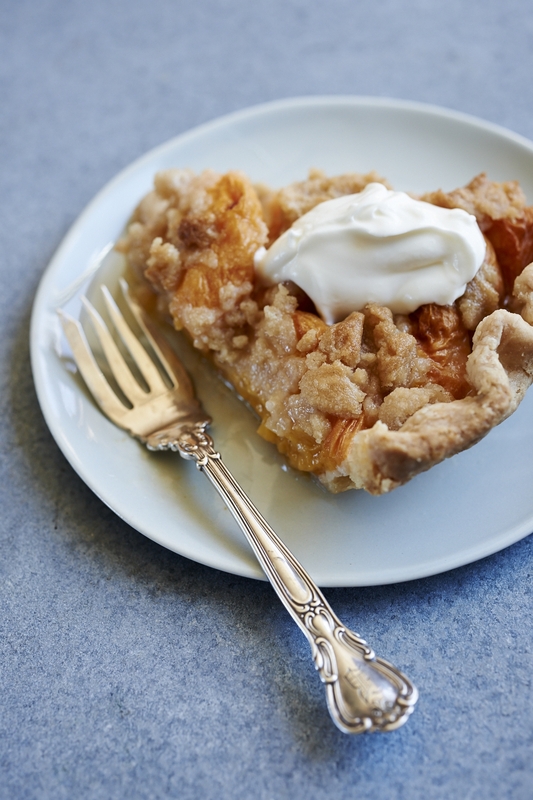 Cover the apricots with the butter and sugar mixture, put into the bottom rack of the oven and bake for 10 minutes. Turn the oven down to 375 and bake for an hour more, until the top is golden. Cool on a rack before serving. 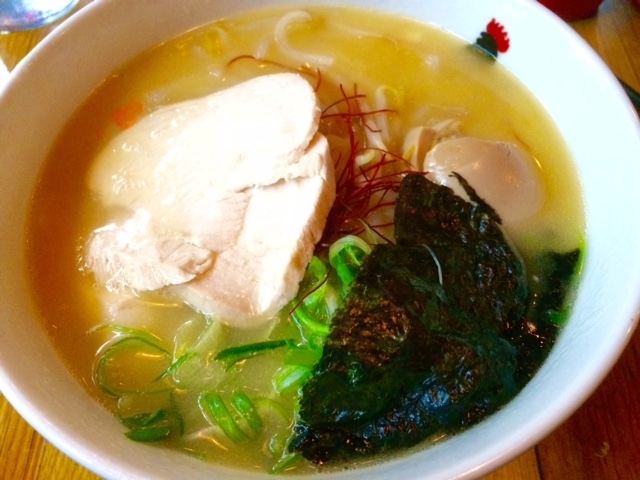 While exploring chicken mania, I went back to my favorite ramen place, Toto Ramen, to see if I still think their chicken-based broth is the best. And yes, I’m still in love with the deep, rich but clean flavor of this satisfying bowl. Worth the wait. 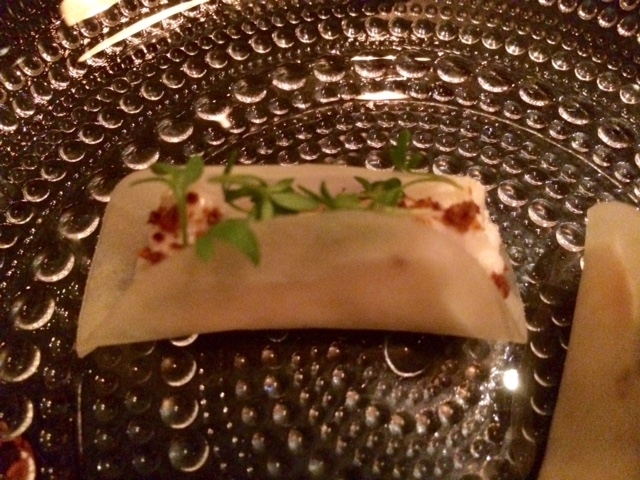 Rambling around the city, munching on birds, I stopped in at Decoy to try the Peking Duck. Oh my! 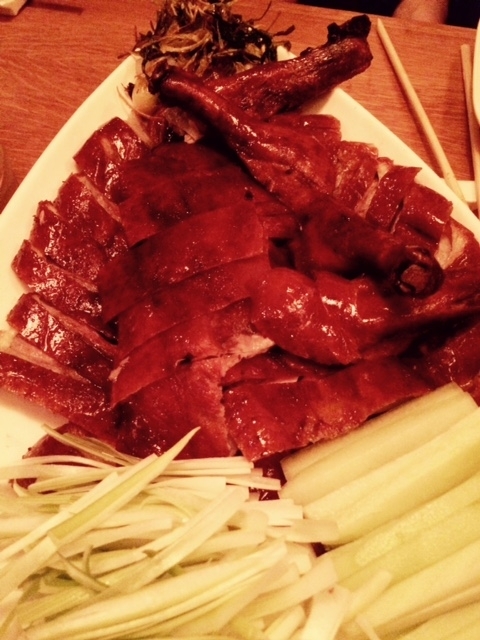 This is wonderful duck – the skin flaking off in crisply satisfying sheets, the flesh luxuriant, tender. The accompanying pancakes are warm floppy little disks, lightly freckled from the pan, a perfect foil for the opulence of the bird. There are scallions, of course, hoisin and cucumbers too. If you like duck, you’ll love this one. 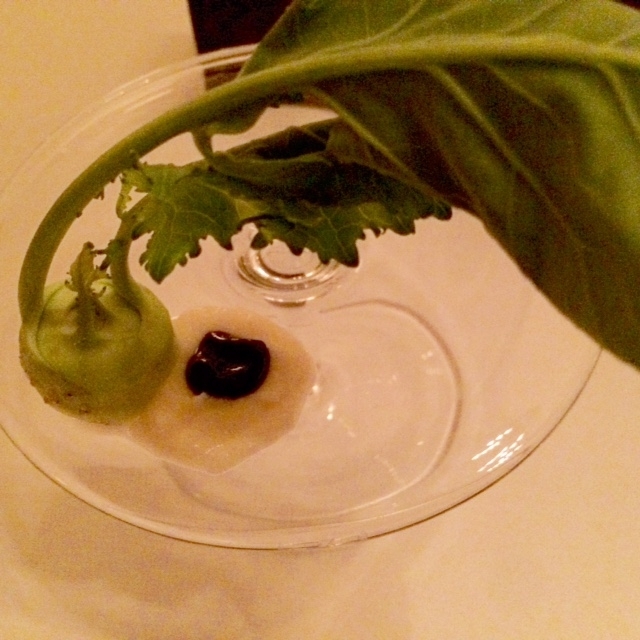 And while we’re talking about Stone Barns, here are a few highlights from that most wonderful meal, including the single most persuasive argument for kohlrabi I’ve ever encountered. An infant creature, refreshing in all its crunchy glory, was served with an oniony puree of vegetable and a single dollop of jam. 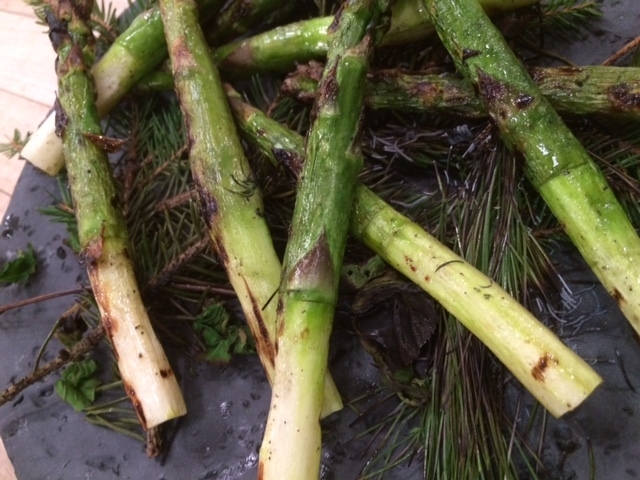 Just-picked asparagus seemed intent on shaming those imported imposters that lack all flavor. In 1970, when I lived on the Lower East Side block where Le Turtle now feeds the trend-conscious, our door was often blocked by bums who’d passed out in the night. The street was littered with the hulking remains of stolen cars – it was where thieves came to strip them – and the bodega on the corner played “Me and Julio Down by the Schoolyard” constantly for one interminable summer. So it might be that nostalgia is clouding my judgement. Or maybe we just got lucky. After all, I’ve only been once. But it was a night of pure pleasure. 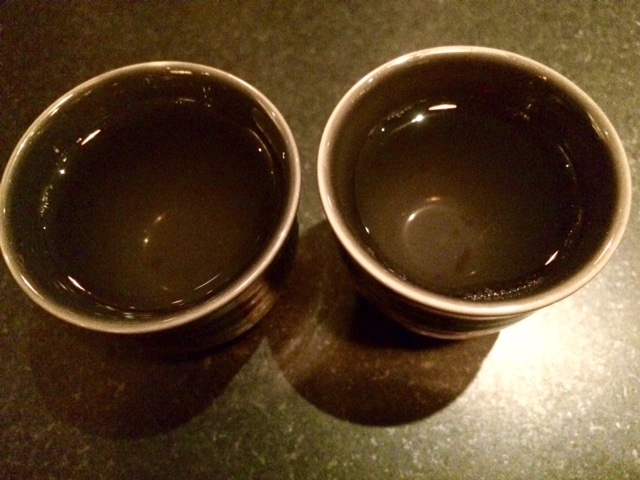 The restaurant hasn’t been a huge hit with the critics, which meant it was only half full. Was that why conversation was so easy? Our waiter was the best kind of professional: helpful, solicitous and not too present. And everything we ate was wonderful. 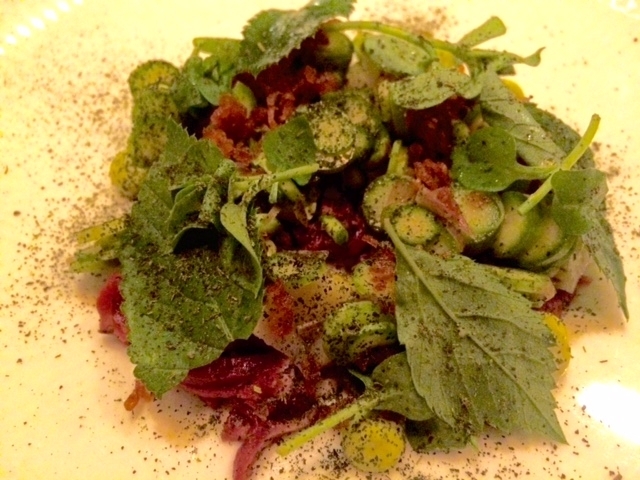 We started with what the menu describes as “romaine, garlic confit emulsion and anchovy breadcrumb with fiore sardo”. That would be, basically, Caesar salad. And a great one it was. Perfect finger food. Generous too. 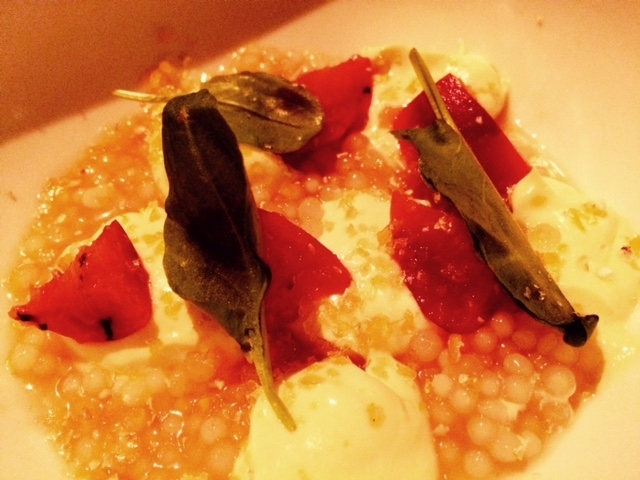 Fresh cheese with ramps, various members of the allium family and slices of green strawberry was utterly irresistible. I could have eaten ten. 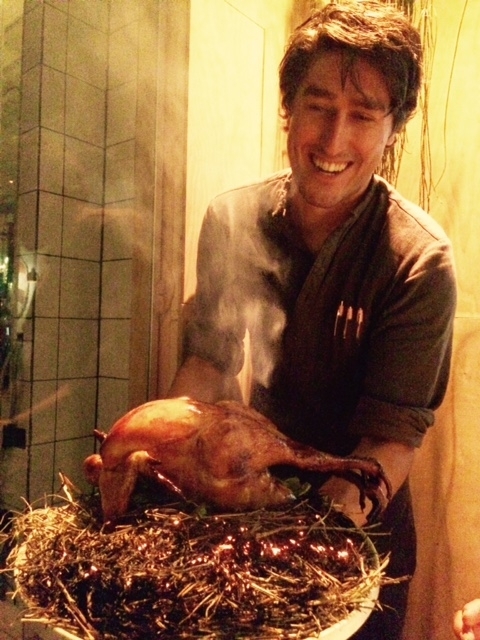 And then, of course, the famous chicken, as presented above. Here it is, all cut up. 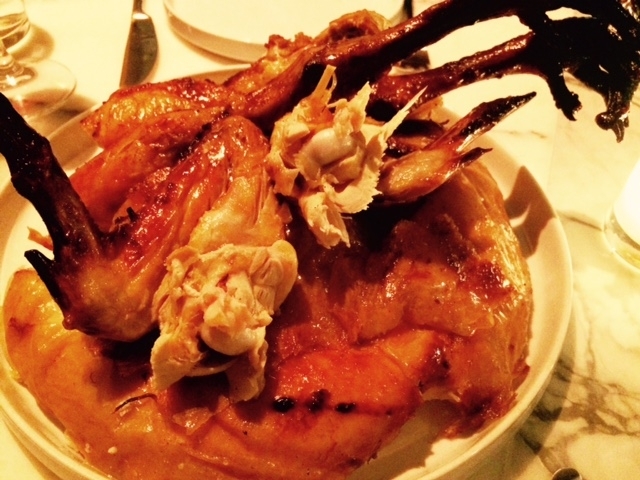 The chicken is fantastic: the skin so crisp it crackles, the flesh moist. And at $58, it’s meant for two but would easily feed four, making it one of the city’s better bargains. Have I mentioned that they serve good wine by the glass – and pour it with a generous hand? But I can’t wait to go back. 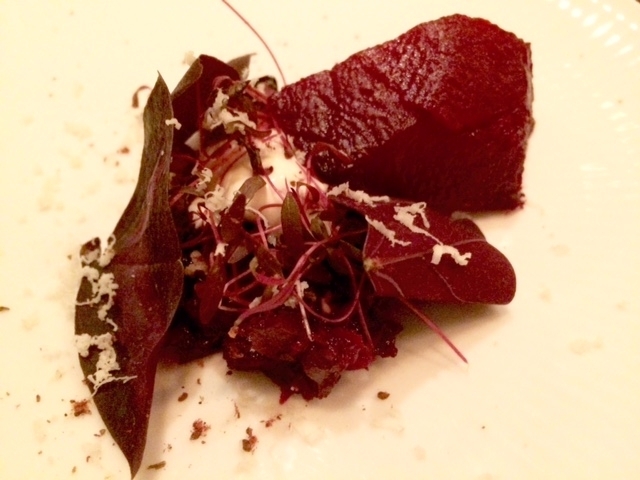 That’s how I felt about the roasted beet at Agern. 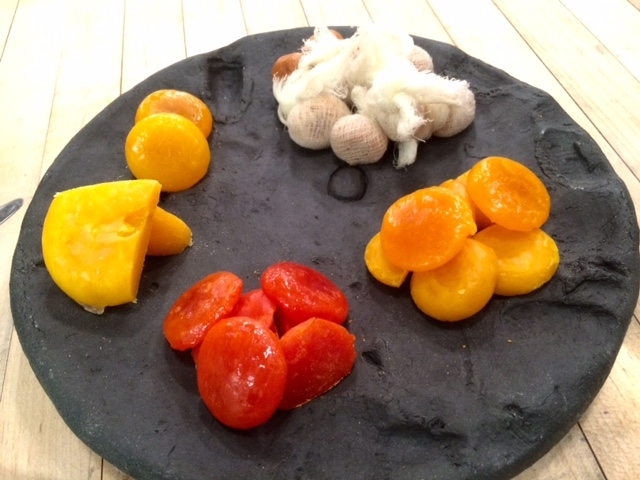 These are vegetables that have been deeply understood, in the best sense, by the chef. It’s as if Gunnar Gislason knows what tubers dream of, understanding that carrots, weary of their simple orangeness, long to be considered complex. He knows that kohlrabi resents being shunted aside, beets are convinced they’re destined for stardom, and pine needles yearn to show off their sweet side. 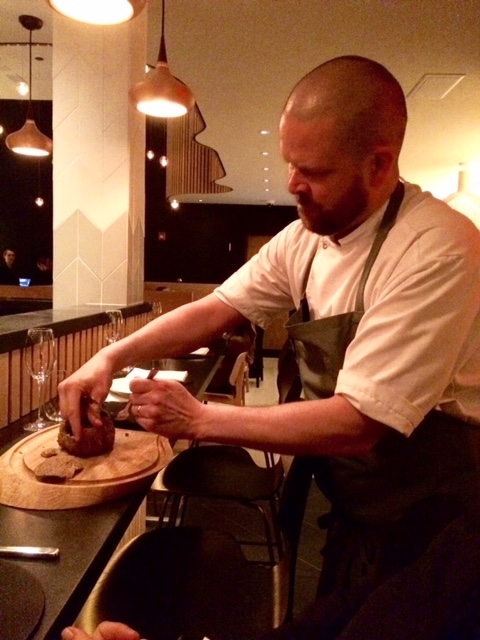 To experience Agern at its best, you have to suspend disbelief and enter Mr. Gislason’s world. This is not familiar food; it is a wild ride into unexpected territory. The meal begins gently, with a clear subtle broth that dares to whisper; it is so subtle you have to concentrate. And then, yes, there it is, the taste of the ocean, the taste of the forest, gently mingling. The chef is demanding your attention, warning you to eat slowly and with concentration. 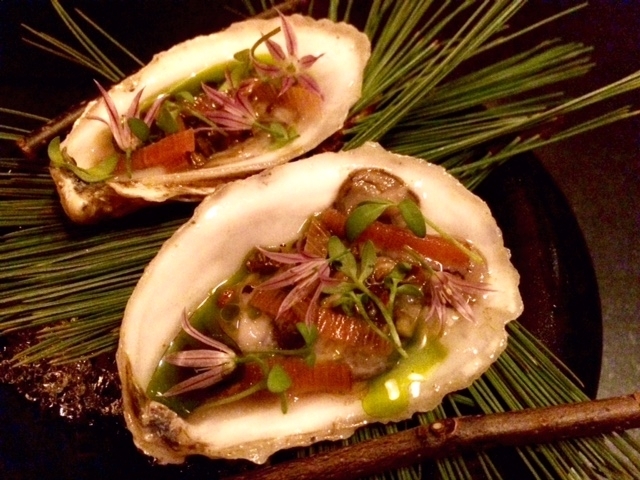 Like an image emerging from the mist, an oyster appears on pine needles, echoing the flavor of the broth, bringing it into focus. As bracing as cold water splashed in the face, this is like tasting a memory. Next there are a series of tiny vegetable tidbits, little trumpets shouting flavor. The combination of a tiny fresh, sweet carrot and a hefty slice that’s been dried and dehydrated is the most memorable carrot experience of my life. 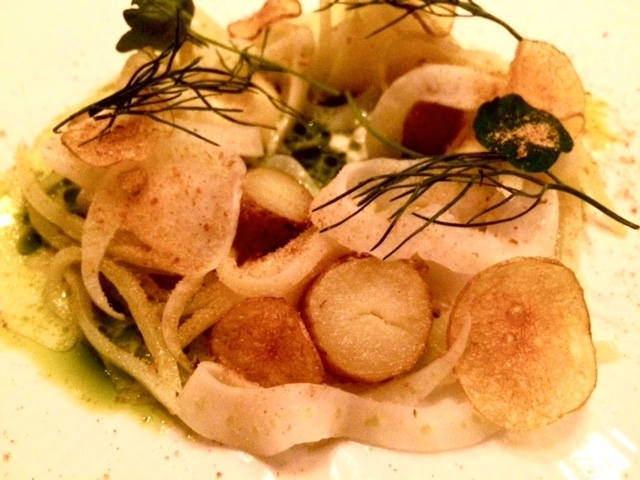 The celery root and parsnip are equally intense, little nuggets of vegetable power. Then there is the contrast of the robust potato bread, all satisfying crackle and crunch, the substantial yang to all that vegetable yin. 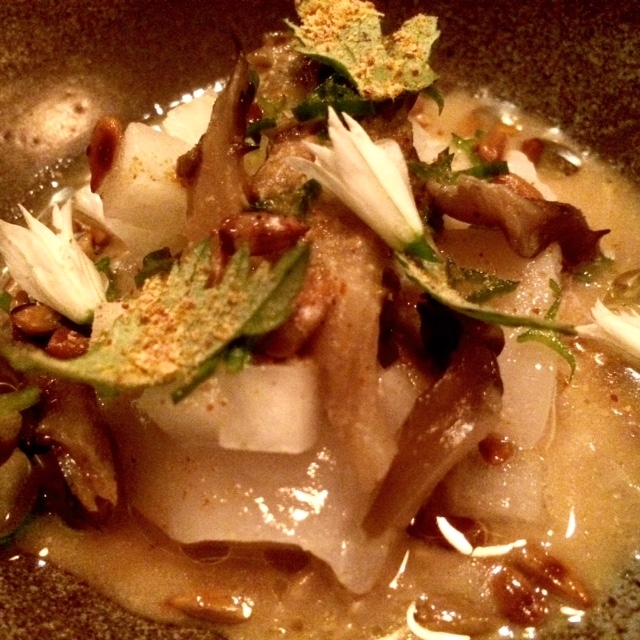 Raw slices of scallop mingle with maitake mushroom, the crunch of daikon, the crackle of sunflower seeds. Scallops are normally retiring creatures, but here they become sassy, daring to strut their stuff. Another surprise: you expect beef heart tartare to be scary food for Vikings. 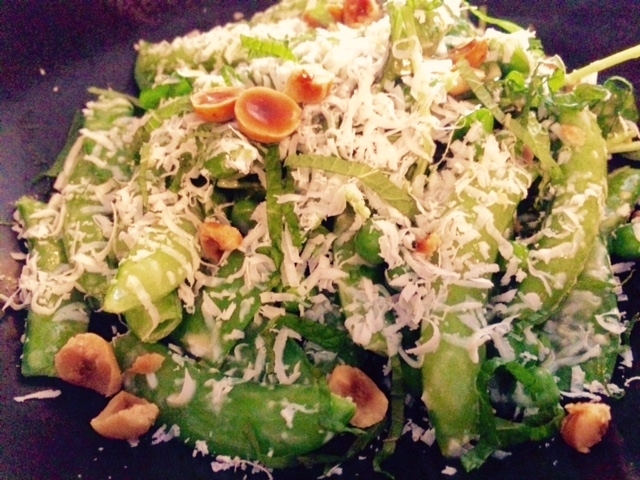 Not in Gislason’s hands; this is the most delicate of dishes, little scraps of heart hiding behind bright green leaves. The timid little morsels are overwhelmed by the crunch of the vegetables, the sweetness of mayonnaise and that scatter of sumac. And now here is the beet leaping toward immortality with the help of a little creme fraiche, the bracing sourness of sorrel, and the heat of horseradish. The chef himself comes out to urge the sweet salt-roasted orb out of its rock salt crust, as if to underline his respect for the dish. Somewhere along this journey various breads appear – one more delicious than the next – along with this presentation of butters. On the left, butter touched with buttermilk. 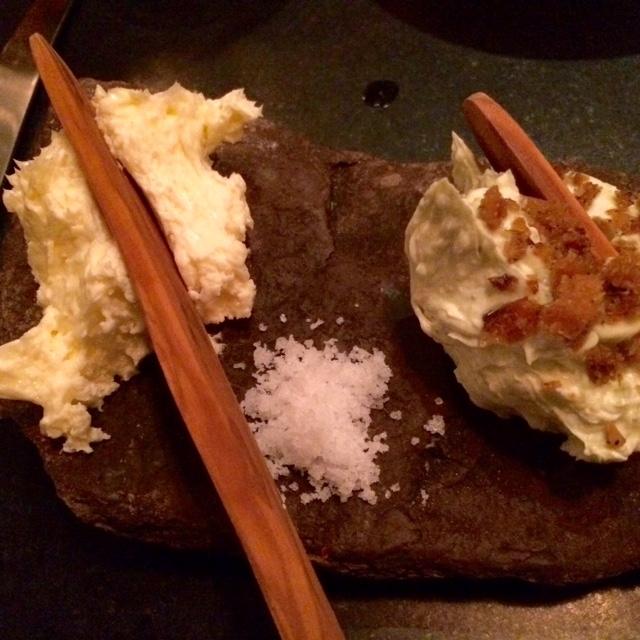 On the right, whipped lamb fat with lamb cracklings. Cod, with potatoes, fennel fronds and nasturtium leaves is lovely, but the most ordinary dish of the night. Eating it I thought, oh, this is the chef trying to fit in. It’s a dish you might find in any good French restaurant. Lamb, however, is another tour de force. 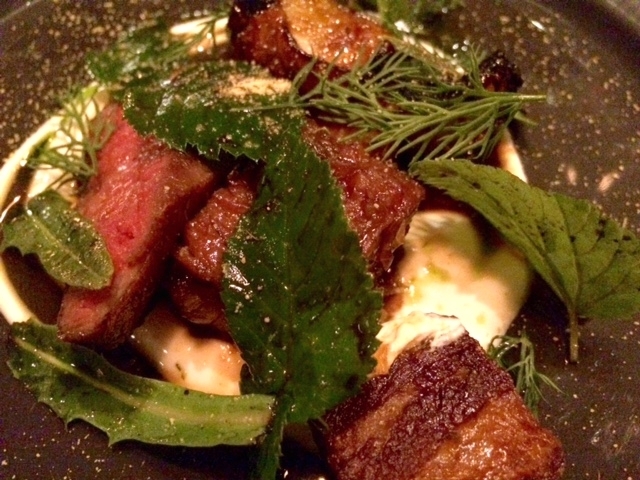 The meat, both braised and roasted, with dandelions, Jerusalem artichokes and dill, is a reminder that the chef is from Iceland (where Gislason was chef at Dill). 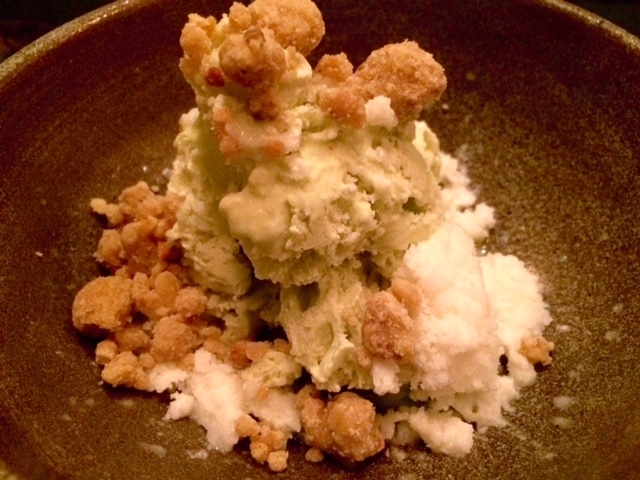 Rambling to a close, we end on a little ode to pine: leaves and nuts strewn with skyr granita. You can almost feel those pine trees grinning. 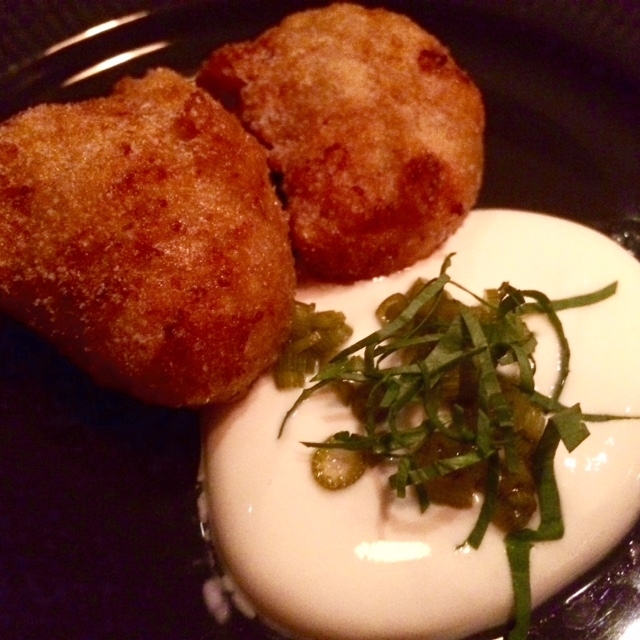 Agern isn’t cheap: the prix fixe menu is $145 (tips included). The restaurant is the brainchild of Claus Meyer, one of the partners in Copenhagen’s Noma, and the word is clearly out in Denmark. The night I was there the restaurant was filled with tables of handsome Danish men eating this food with appreciative gusto. 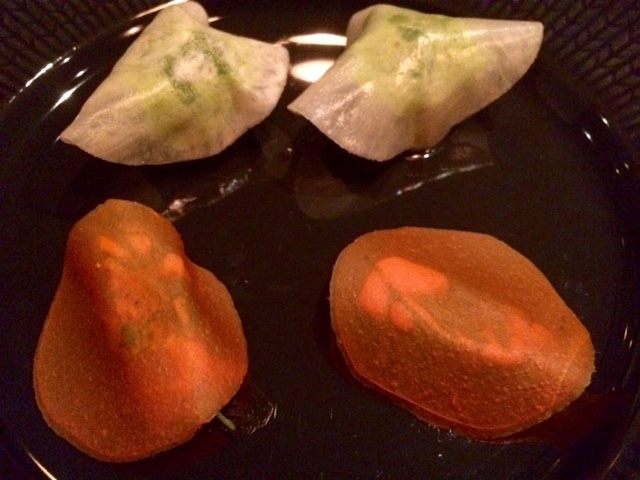 So here’s the question: will New Yorkers respond to this fascinating food in the same spirit? I hope so. This is just the beginning. I can’t wait to see what happens next.